I’ve been shocked over how much QE and stimulus the central banks have signed on for in the last seven years, but they’re finally starting to reach their limit. The U.S. already did in 2014 when the Fed finally tapered. And this week, the markets are betting on a rate hike – never mind the trouble brewing in China, other emerging markets, and now Europe. There’s just too much going on in the world suggesting deflation is the real fear, yet the Fed’s betting on 2% inflation to justify a hike. Give me a break! There’s a reason the Fed has put off raising rates time and time again, and it hasn’t gone anywhere. The fall in commodities prices is nowhere near its conclusion. That will only continue to ravage emerging nations as those prices continue to fall for several years. And now Europe has its own troubles that are only getting worse… and could potentially signal the end of the euro and the economic bloc itself. Recently I explained why the attacks on Paris were such a major issue. It was like the 9/11 wake-up call over here. Sure, our attack was larger. But Europe’s came after the recent terrorist attack on Charlie Hebdo, and while a massive refugee crisis was already calling everything into question. This recent escalation in terrorist events, including the Russian Metrojet being bombed, only creates an atmosphere within the euro zone of individual nations re-asserting their own sovereignty over one another. And that includes controlling their own borders and trade flows. That’s been the major flaw of the euro and the euro zone from the beginning. Or 800,000-plus refugees from Syria and the Middle East, with three million or more still expected to come. It’s a giant mess! And the refugee crisis specifically is a huge expense to the many European nations accepting them, all while they’re teetering on the verge of recession again. The truth of the matter is that the euro zone came late to the party. A trade and currency union was doomed from the start. And now that union is increasingly disintegrating. That can only get worse if the global economy continues to implode, and I see a 99% chance of that in the next few years. All of that’s piled on worsening demographic trends ahead, and the continued rise in geopolitical threats through 2019 on my 35-year cycle for that. With massive QE, and the pledge from ECB President Mario Draghi that he will do whatever it takes to reach target inflation, most think the euro zone has largely come out of its crisis. Little do they know the economic bloc is basically falling apart. Shown here are the percentage of loans outstanding that are at least 90 days past due, and the percentage of these nonperforming loans to GDP. This ranges from the first tier of banking systems that are already clearly insolvent… to the few strong, yet small nations that are nearly sound. Among the worst are the usual suspects – Italy, Portugal, Spain, Ireland, and of course Cyprus. 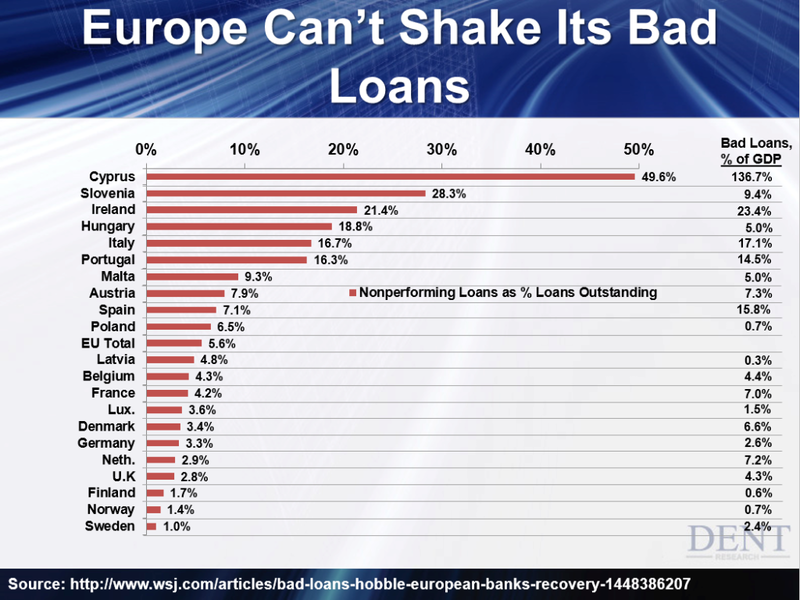 And I doubt it’s a coincidence that Greece isn’t even on this chart. To put it simply – Europe is caught in a downward spiral of its own making. The euro allowed the weaker countries to borrow at lower rates on their loans… and the stronger ones to export at lower rates on the currency. Now it’s coming to a head… and this great imbalance could unravel the whole system. While North America will merely plateau in the years and decades ahead, this period will potentially represent the Dark Ages for much of Europe, with terror threats only getting worse in the next several years. Meanwhile, Janet Yellen is raising rates… and Mario Draghi is convinced he has an unlimited box of tools to rig Europe’s economy, even though he recently failed to muster enough votes at the ECB to raise QE as expected. Make no mistake: Europe is dead. It’s just that no one has announced the funeral yet.